Carved from Greek marble in the third century, this sarcophagus was in the garden of Palazzo Riccardi in the beginning of the 18th century. On the left part of the main side we see Phaedra’s unhappy relationship to her step-son, Hippolytus. 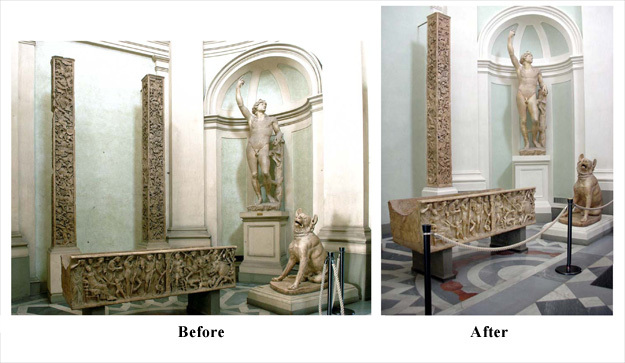 Ancient sculptures used as architectural and garden decoration require restoration from the natural elements to which they have been exposed, often for hundreds of years. When the Direction of the Gallery expressed the intention of integrally restoring the Lorraine staircase and the vestibule of the Museum and, as usual, invited the Association of the ‘Amici degli Uffizi’ to participate, it seemed to me that there was no better solution than to involve our partners from America, the ‘Friends of the Uffizi Gallery’, our affiliation within the United States. There was no doubt the effort would be an historic one given the intervention regarded ancient marbles of great importance, the majority of which were on exhibit in one of the noblest sections of the building, an area that, as part of the project, was to be restored to its original color scheme. Now that all is done, I can say that we made the right decision: the ancient sculptures truly enrich the landing overlooking the monumental staircase and, above all, the oval vestibule, safeguarded by the effigy of Peter Leopold, the man responsible for the creation of the Gallery’s magnificent new entryway.